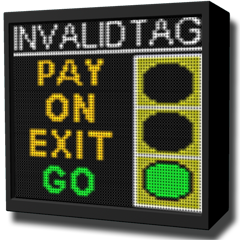 Driver Feedback Intelligent Transportation System Signage is used in the manned and automatic toll collection process throughout multiple locations in the United States. The aim of this technology is to direct traffic in a safe and convenient manner. With customizable software and graphics, this technology will work for any toll system that is looking for an updated reliable program. Lane Indicator Intelligent Transportation System Signage is used to direct drivers safely to the correct lane before reaching the toll collection area. Through the use of LED technology, drivers are made aware of lane payment options and closures giving them enough time to safely decide to which lane they should proceed. 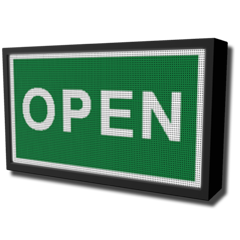 Customizable software and graphics are available for this signage upon request. Wrong Way Deterrent Intelligent Transportation System Signage is a new technology used to deter drivers from entering exit ramps due to confusion or unfamiliarity at an interchange. 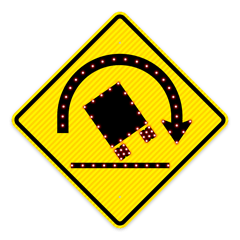 Once a driver has entered the exit ramp and traveled a measured distance, radar attached to the sign senses the car and activates the sign’s LED technology. The sign will then actively flash the words “Wrong Way”, “STOP” and other messages to alert the driver they are traveling in the wrong direction. Here at Fiberdyne Labs we pride ourselves on creating innovative, dynamic signage. If you need a customized Intelligent Transportation System sign let us know!